These Crockpot Chicken Tacos are so delicious and super EASY to make. They only have a few ingredients and cook in the crockpot for a few hours, so you are free to do what you need throughout the day. These shredded chicken tacos are a real crowd pleaser between the green chiles, spices, and creamy cheese… you have just taken taco night up to a whole new level! Get ready for Taco Tuesday, because these slow cooker tacos are a meal that adults will enjoy as much as the kids! My crockpot is one of my favorite things in my kitchen. I use it a lot during the week and especially on nights that my kids have events that I have to run them to all afternoon. Busy weeknights become a little bit more managable when I can throw dinner in the slow cooker. These Green Chile Slow Cooker Chicken Tacos came from my Crock Pot Green Chile Chicken recipehere. I have several more easy dinners I will be sharing with this chicken as we go on, so make sure and sign up for my e-mails so you can collect all of the ways to use it as I post them! One of my kids favorite thing is Taco Tuesday! They look forward to Tuesdays every week. I like to change it up and these are just the perfect recipe. To serve these I like to set everything out on the table and let everyone make their own so they get exactly what they want. As a bonus, my kids eat better when they have a hand in making their meal. I have listed a large number of toppings, this is just for ideas. We usually choose 3-5 to serve on the table. If you are entertaining and want to add more, feel free, options are always nice. We generally like to eat our tacos with one of these sides. You can ‘t go wrong with any of these delicious dishes. I also put limes on the side to squeeze on top of the taco. If I missed a favorite side, let me know in the comments so I can try it out! 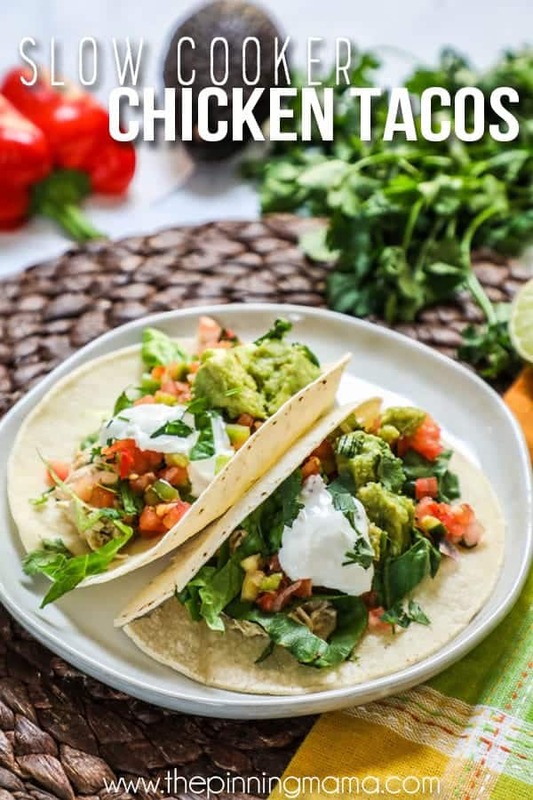 These delicious shredded chicken tacos are super simple to make! In only a few steps you have tacos ready to go! Combine the chicken, spices and green chiles in the slow cooker. Cook on low until the chicken is cooked through. Shred the chicken then return it to the crockpot with the cream cheese and mix together. Place the chicken taco meat, toppings, and hard or soft shells out and let everyone make their tacos! I am going to try and answer some of the frequently asked questions on this chicken taco recipe below. You can scroll down to the bottom of this post for a printable recipe card with full instructions. If you still have questions after reading through this section, feel free to leave me a note in the comments below and I will try to get back to you soon! Can I use chicken thighs or other cuts of chicken in this recipe? Yes, you can use most any cut of boneless skinless chicken you like best in this recipe including chicken thighs and chicken tenderloins. The cooking time may be changed if a different cut is used. 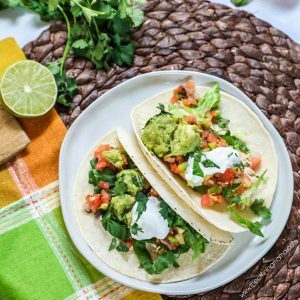 Can I leave out the cream cheese in this taco recipe? I think the most delicious way to make this is with the cream cheese, but if you are looking for a dairy free, or lighter version, then it is possible. You can shred the chicken and then drain any excess juice and use it as pulled chicken in the tacos. What do you recommend for taco shells? There are a variety of options you can use for taco shells. We most often use flour tortillas for these because it is what my kids prefer. You can also use hard shells, corn tortillas, or lettuce leaves. Are these tacos gluten free? Can these Crockpot Chicken Tacos be low carb? Yes, this recipe is low carb as long as you use a lettuce leaf as your shell. Then load on all your favorite topping and you have a delicious taco. I really love leftovers, but these are so delicious you might not have any. Here are a few ideas of what to do with the leftover crockpot taco meat. Nacos- Load up tortilla chips with your favorite topping such as beans, corn, bell pepper, and chicken. Bake at 425 or 10 min or until these is melted. Top with salsa, guacamole, and pico de gallo. Crockpot Chicken Taco salad- Use all of your leftover taco toppings and pile them high on a bed of lettuce. My favorite lettuce is romaine, or a mix of romaine and spring mix. You can drizzle on this homemade ranch dressing for a real treat! Crockpot Chicken Burrito Bowls- Start with a base of rice and beans and then pile on the crockpot chicken taco meat, and all of your favorite toppings. I recommend storing the meat, shells, and each topping separately. Assembled tacos will not store well. You can keep the meat in an airtight container in the refrigerator for up to 3 days. You can freeze the meat before or after cooking and make the toppings fresh when you serve the tacos. Just simply place the chicken in an air tight container for up to one month. I really hope your family enjoys these Crockpot Chicken Tacos for Taco Tuesday as much as my family does! You will love every bite you take of these crockpot chicken tacos. They are flavored with green chiles, cumin, and garlic and then made extra special with the addition of cream cheese. You can pile the toppings on these tacos or even make them a great low carb friendly meal. Lay the chicken breasts flat on the bottom of the slow cooker. Cover with the green chilis, garlic powder, cumin, salt and pepper. Cover and set to low for 4.5 hours. At 4.5 hours, open the lid and use forks to shred the chicken and mix it with the juices. Then lay the cream cheese on top of the shredded chicken and replace the lid and continue to cook on low for 30 more minutes. Place the taco shells, meat mixture, and topping options out on the table and let everyone add toppings as desired. Enjoy!